When Suicide Sally: A Celebration Of The Music Of Suicide And Alan Vega unfurls in real time on January 25 at The Bowery Electric in Manhattan, the sold-out live event promises to go beyond mere renditions of classic Suicide songs and those of the late Vega. This time, it will most likely be deeply personal. Led by Jesse Malin and Mr. Pharmacist (Gregg Foreman), the live celebration will include old friends and collaborators—Martin Rev of Suicide, Ric Ocasek, Ben Vaughn—as well as those who followed in Vega’s footsteps: JG Thirlwell (Foetus), Peter Zaremba (Fleshtones), Kid Congo Powers (Cramps, Gun Club), Eugene Hutz (Gogol Bordello), Bob Bert (Sonic Youth) and Cynthia Sley (Bush Tetras). If Lou Reed was NYC’s saint of the streetwise, Vega was its soul. I don’t know what’s more fascinating about your Twitter tagline—the art or the boxing bit. Funny you should say that. Alan was a boxing fan from way back. That does not surprise me. I am a fanatic as well—the whole mano-a-mano thing. The early days of listening to boxing exclusively on the radio—he was so fond of that. And Alan put Mike Tyson into a sculpture of his before anyone really knew who Mike Tyson was. That theme has appeared and reappeared in his visual career as well as the music. He’s always talked about warriors and underdogs—that passion and drive. Boxing is not a game. It is a science, and you are literally putting yourself in a situation where you could be killed. Alan felt that was about being on the stage. He had tremendous respect for athletes on the whole and boxers in particular. They put their life on the line for their artistry. So how do you figure into that? Fighting teaches you tremendous life lessons. About 11 years ago, I started boxing to stay fit. I was coaching my son’s soccer team—I played varsity soccer in my youth—from the ages five to 15, and by the time they hit eight, they start getting stronger and faster. I liked to scrimmage with them because I’m not a sideline-type coach. So I just starting boxing to keep up for fitness. The traditional club I was in they, call it a white-collar boxing club because the men and women who were there—on Wall Street—were investment bankers. About five or six years in, one of the owners of the club knew that I managed Alan’s art and music and asked if I would do the same for some fighters. So I got my manager’s license and began managing a female fighter first because it is tough for the females. So much of it is pay-to-play—you have to really build up a track record and support and sell your own tickets, and someone picks you up. Yeah, where you have to build up your own support system and following until the big guys come in and put you on the bigger stage. Interestingly enough, I want to be in the Guinness Book Of World Records and make my boxing debut as the oldest professional to hit the ring for the first time. I’m 50-something, and the record is currently held by a man who was in prison for a crime he did not commit, and when he got out, Bernard Hopkins put him on the undercard. I’m moving toward that. I’m working on my defense, and I’m very aggressive. My son Dante—I spar with him. He wants me to know what’s it is to get hit in the face. I did the same with a lot of professional boxers—men—in the past, but I need to get hit in the head and get my defenses up. Too many men won’t hit me. Women—they will go at you. They’ll kill you. But with women, I go right at them, too, so they don’t want to spar with me. This is the woman Alan Vega fell in love with. What were you doing circa 1987 when you met him? I actually met him Oct. 23, 1985, at a record-release event thrown for him by Elektra Records for his Just A Million Dreams album. I was a second-year associate at a corporate law firm, and one of my colleagues was the sister of his guitar player at the time. We were actually going to pick him up at the Gramercy Park Hotel, as the party was at the Palladium. I didn’t know who Alan Vega was even though I did play drums in a band—did so since age 16, nothing serious—in Boston and knew the Dead Boys and the Neighborhoods. Even knew the Cars, though I thought they were pop. Suicide and Vega? Nothing. So anyway, we go to pick him up, and he whips open the car door, and the first thing I notice is that he’s got this crazy amount of energy. I mean, it was just radiating off this person. We get to the Palladium, and there are these three light sculptures on the wall. On the floor were effects pedals—a real mish mosh of electronic stuff, and he just took command of it all. I was impressed. He was impressed with me, too, as I was this lawyer by day, punk-rock chick at night. Weird because my colleague thought I would click with her brother. Alan kept leaving his circles of well-wishers that night and coming over to me especially, as he was leaving the next morning for a tour of Europe. After that night, I didn’t see him for six weeks. Oh, and here’s the weird thing. I’m into astrology—not heavily or obsessive but fascinated—and that very morning I read my horoscope that said that I would meet a lamb in wolf’s clothing. Honest to god, Alan that same night when I met him was wearing a belt buckle that read “WOLF” all over it. That was really intense. I still have it in my collection of Alan things. 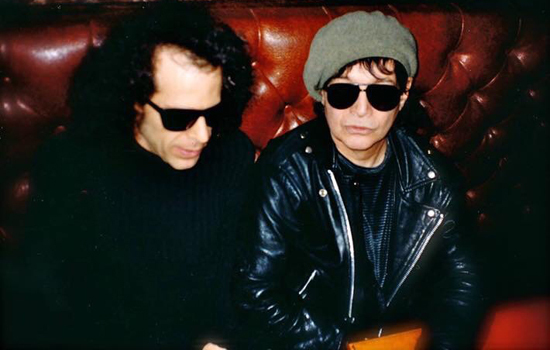 That was my initial meeting with Alan Vega. 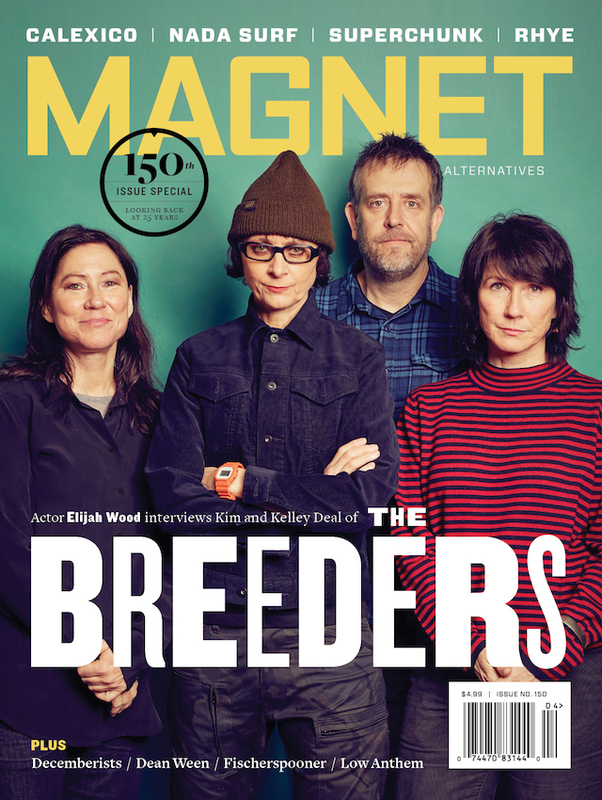 He came back from the tour—I couldn’t get him out of my head, that visceral reaction to his presence, and he to me—and as soon as he got back from that tour, I met him at the Gramercy Park and we just talked for hours. We were together from that on. Was he keen to work with you as a drummer? Not really, because he used to have a keyboard player in his band—Anne Deon—who was his girlfriend. A very passionate Italian woman who slowly kept edging her way to center stage. It became something of a rivalry between them. I don’t think he dug that, and that wasn’t what I was about, either. That would be the end of our relationship, so I kept it cool. At that point, he was very much about deconstructing his music. He would work with producers and come up with polished stuff such as Just A Million Dreams, but then he would do a song like “Ra Ra Baby”—he did that when the producer was on break—that was just sheer energy and noise. He really wanted to get back to that level of raw, that deconstruction. He had this thing—this theory—of “no note,” where you held down all the keys of a keyboard all at once. Black on black. You didn’t have to focus. He liked me as a drummer because I kept it simple, didn’t do any fills. Keep the beat: the purity of simplicity. Very minimal. Right out there. So vulnerable. Nothing on the front line or spotlight. That stuck out for Alan. Can we strip it down? The paradox of that is when you hear it, hear what he did, it was true rhythm and blues. When you get a gut feel of where that is going to or can go, that was intense. I do not know if we will ever hear again a vocalist who was as pure as Alan Vega. He always did the vocals last when he got to the studio. The music would be done. He would just go into the booth without any idea or knowledge and just wail. He would write sketches nightly, tons of notebooks, that he would use as a framework but then go into a studio and freestyle from there. Done in one performance. And the placement was always unique—where he placed his vocals within the context. I get really excited thinking of all this. You should be. I’m married to a talented artist. I get it. How, then, did you get to be his collaborator, producer and drummer? It really was just an evolution. So natural. No plan. No expectations. That was the beauty of working with Alan. Some of the roles I executed early on … I mean he had me working these machines by hand that I had never played before. Neither had he, really—he wasn’t this amazing musician. But he just knew sound. He was the director of sound. The tape was always rolling, and he always just knew immediately when you had hit upon something. Everything from 1987 through to 2016 was just us manipulating hours and hours of tape and until we got what Alan thought was totally unique. That was his mission: something that had never been heard before. Eventually I would say, “Hey, we’ve been doing these 40 tracks for years. Can we pick 11 of them that we can turn into songs and Alan can sing on them?” He loved that challenge. He wanted to keep going until it became uncomfortable. As soon as he got it, he had to push past it. He would do the same thing with sculpture: He would work on something that seemed finished, then smash it and start again from there and deconstruct that. “Alan, can’t we save that? Alan, can’t we hold on to that song as is?” No. He would tape over things and smash things because to him it was irrelevant as soon as he did it. That was his ethos. He always needed to move forward. He never went backward. When we did—when we went through his vaults—we would find stuff that just was so amazing and timeless. Alan’s music transcends time and space. Probably because he was searching for the unknown. Is that how IT was created—culled from tracks—or was it more centered and specific? Maybe I’m overstating. He would bring CDs back from the studio and center on a core group of sounds or songs. “This needs more bass.” “This needs a sound that could be a guitar or a lawnmower.” That is what became the cohesive whole. I would push to get him to which songs went forward from there, then got mixed, had vocals out on and such. What was hardest then was getting him to commit, and commit with lyrics and vocals. Because that was a statement. Yes, there are universal themes that happen to or with our collective consciousness, but he had trouble with the idea of putting something out into that consciousness. He was uncompromising in his vision, but he was vulnerable once it was out there. He was the heart and soul of his own music. I just kept it on track. Even when he had his stroke. So he knew time was closing in? I mean, he was going back and forth from sculpting and making music and doing songs that evolved into IT at a time when he could’ve dropped dead and knowing that his arteries were blocked. His doctors didn’t even want to unblock his carotid arteries because they thought it would cause another stroke. Even toward the end, he kept doing these portraits of faces that had lost any distinction—no faces. He was connecting with the spirit world. His last group of paintings had no faces; it was degeneration. And those paintings were connected to the songs of IT. They had the same names. He knew this was his final statement. And the message was inspirational: After going through generations of war and strife, you can’t let anything stop you. You have to get up and move forward.